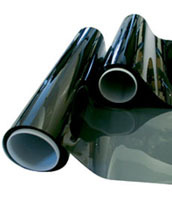 Window Tinting Films are many and varied. If you want the best looking, highest heat rejecting films, look no further. We got you covered. How many different films are there for your car? The answer is - there are SEVERAL. Below we have assembled a list of the various window films available today and what each of them do. We have also tried to explain the benefits and downsides (if any) so you can make an "informed choice". Finally, you will see the films that DT Services Window Tinting carries and installs and our recommendation for you. Glue Based Dyed Films were the first to be developed and continue to be the plague of our industry. These films amount to nothing more than clear polyester film with dye mixed into an adhesive. They are cheap to make and cheap to install, making them a favorite with $99 tint shops around the country. They have major performance issues and should be treated as strictly a bargain film for those NOT keeping their vehicles longer than a year. Glue based dyed films are less effective in controlling solar heat gain because these films control heat by absorbing solar energy. Once the film is “saturated”, the excess heat is released into the vehicle. The sun will turn these purple as the dyes are destroyed by constant solar radiation. Most of these films are made in "sweat shop" environments in 3rd world countries who don't follow ISO standards for quality. Stay away from these films and the shops who use them! We DO NOT recommend these films. We DO NOT install these films. Color Stable Dyed Films are MUCH better in quality and longevity, offering signal friendly properties and an overall pleasing experience. Laminating the dyed polyester behind at least one layer of UV enhanced polyester (acting as a shield for the first layer) and then followed by a second layer of dyed polyester treated again with UV inhibitors. The finished result is a very good dyed film that once installed will enhance the appearance and cool the interior of the vehicle. We HIGHLY recommend and install these window tinting films as they are good overall performers, carry a lifetime NO-FADE warranty and will look GREAT as long as you own your car! We have devoted a whole page to this fascinating new film! You simply must check it out! These are some of the BEST window films you can put on your vehicle. They are well worth the up charge in price and will have an immediate impact on the temperature inside your car. On some summer days you can quite literally fry an egg on your dash because of the heat pouring in through the windshield. This is impossible to do if your windshield is tinted with a Ceramic or Infra-Red window film.